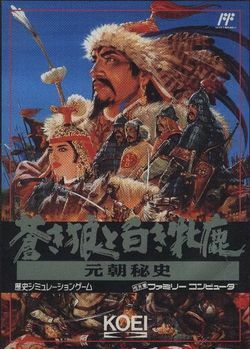 Genghis Khan II: Clan of the Gray Wolf, originally released as Aoki Ookami to Shiroki Mejika: Genchou Hishi (蒼き狼と白き牝鹿・元朝秘史, Aoki Ookami to Shiroki Mejika: Genchou Hishi? ), is a 1992 strategy game developed by Koei. It is part of Koei's Historical Simulation Series of games, and is the sequel to Genghis Khan, though this is the third game in the series. Genghis Khan II was developed and published for the MSX, NES, DOS, X68000, PC-98, PC-88, Sega Genesis, SNES, Sega CD, PC Engine CD, and later the PlayStation. The SNES version was also made available on the Wii Virtual Console in North America on June 8, 2009 and in Japan on May 11, 2010. This page was last edited on 20 February 2018, at 07:32.